The 2018 Minnesota United FC season is at last over. On one hand, hallelujah. It’s been a miserable season for the Loons, who took as many steps backward as they took forward. The offseason begins now, and hope springs eternal. There’s always next year. On the other hand, it’s a bummer. When you look forward at an offseason, it’s easy to think about all the changes that might be made and natural to compress time and imagine them all happening at once. But in reality, they are drawn out slowly over three months, maybe more, and the gaps in between feel interminable. Even when your team is bad, the season is always more fun. I’ve been dreading writing this final Matchday column, not just because of the ennui of the approaching offseason, but because I feel as though I have said all I have to say about this version of the Loons. There are only so many times you can question your club’s total ambivalence about developing young players, even when there is literally nothing left to lose. There are only so many times you can wonder how Tony Pulis can organize a stout defense for a relegation-threatened club in a month but your team’s coaching staff can’t figure one out in two years. There are only so many times you can fume about your club’s year and a half of machinations to destabilize successful, productive, fan favorite players, and replace them with unconvincing facsimiles. The less that is written about what passed for a media charm offensive last week from Head Coach Adrian Heath and Director of Soccer Manny Lagos, the better. After a year in which fans were fed a steady diet of implausible excuses, let’s just say that we learned nothing new. The central fact remains that Loons began the year undermanned, poorly organized, and badly led, and that’s also how they ended it. How that occurred is either a mystery that the club is not interested in investigating, or a secret that they are very invested in protecting. There is no evidence yet that anyone will take accountability commensurate with this failure, and at this point it’s probably best for all of us that we just take a three month break from asking. So in an effort to turn the page and think about the future, let’s talk about the Loons’ next moves. The upcoming season is a crucial one. The team’s off-the-field staff have done an admirable job at building a fanbase despite the team’s poor results and increasingly dire style of soccer. Comfortably ensconced at their new home in Midway, fans will now demand better, and the club is out of excuses and time. Having spent two years learning painful lessons, it’s time to demonstrate the value of what has been learned. 5. Take more seriously the team’s long term injuries, and evaluate the attack from there. On the few occasions that club officials have commented on the woes of the past season, they have most commonly blamed injuries for the malaise. It’s true that early-season ACL tears for Kevin Molino and Ethan Finlay were blows, although the team recovered quickly by signing Darwin Quintero and reluctantly discovering the talents of Miguel Ibarra. It’s also true that nagging injuries slowed Christian Ramirez early in the season, and Abu Danladi throughout it. The Loons were not the most hard-luck team in the league in terms of medical issues, but they can rightly claim some misfortune. That’s not so bad! But if the fitness of any of those players is a significant question, then the Loons will have holes to fill. The team cannot afford a repeat whatever on earth happened with Sam Cronin last year. The defensive midfield veteran got a concussion in August of 2017, did not play the rest of the season. Yet throughout the offseason the club kept insisting that he would return, and he did play a single preseason match before never being heard from again. It seemed self-evident to everyone that Cronin’s concussion issues were severe, and it was baffling that the team evidently built their entire 2018 plan around his presence. That kind of mis-evaluation, wishful thinking, or whatever, was an unforced error that can’t happen again. 4. Invest in the midfield. The root of the Loons’ problems from the start of their time in MLS has been an awful midfield. It is hard to remember a single game in which the Loons have held sway in the center of the park, at least against an opponent with eleven men. The team is overloaded on league-average box-to-box players and is dreadfully short on defensive midfielders. Rasmus Schüller and Collen Warner are just about the only midfield players who seems to have an affinity for going into tackles, and Ibson and Collin Martin are just about the only midfield players who have any kind of creative passing eye (in Martin’s case, something we were able to see for the first and only time on the last weekend of the season). The club’s unserious approach to the position is exemplified by the still-extremely-unacceptable signing of the coach’s son to fill a roster spot here. The offseason should merit a pretty thorough rethink of the team’s tactics and personnel in the midfield. The first priority must be to identify a player to build the midfield around, much as Darwin Quintero is the obvious centerpiece of the attack. Virtually all of the top teams in MLS this season have such a player, some of them even have several! The Loons have two open designated player spots (technically they have one, but Rodriguez can easily be bought down). Using at least one DP tag to provide a bedrock for this woeful midfield is essential this offseason. Using both spots to completely renew this entire area of the field would be even better. 3. Invest smartly in defense. As just about anyone who follows MLS in passing knows, the Loons are terrible in defense. A better midfield will shore up some of these issues, but there are also serious problems in the back line. The Loons have a lot of question marks here. Francisco Calvo, the team’s most talented defender, is also potentially its greatest liability. Early in the year, the Costa Rican struggled as a centerback. After the World Cup, the team adapted to his most common international position as the left side of a back three. Late in the year, he was moved again to play as a left back, and even scored twice from this spot last weekend. Beyond Calvo, the team has local boys Brent Kallman and Eric Miller, both of whom have stood out mainly for being the least problematic parts of an extremely problematic defensive unit. There’s also Wyatt Omsberg, the tall and gangly first round draft pick, who never seemed to get a serious chance this season, Marc Burch, the veteran fullback who seemed a step slower this year, Jérôme Thiesson, the well-liked Swiss fullback who appears to have somehow managed to get on the enemies list of the coaching staff, and Michael Boxall, who was the one consistent figure in a season in which the team conceded a club record 71 goals. It’s a little hard to evaluate any of these players given the disorganization of the entire defense, and that suggests that the club might make the most impact by hiring a new assistant coach. A while back it was reported that Assistant Coach Mark Watson had taken charge of the defense, and we’ve heard basically nothing about it since, presumably because nobody wants their name publicly associated with a defense that allowed 71 goals, and was somehow worse in a year without Vadim Demidov. It would surely help for the club to seek some outside expert help to relieve their chronic defensive pain. Otherwise, this is an area of the field that also deserves a lot of attention and no small bit of turnover. The history of MLS teams spending DP spots on central defenders are not good, but the results of MLS teams spending good money to woo solid, league-proven, unflashy defensive experience have been much better. Seattle is still reaping the rewards of signing Chad Marshall. Toronto won MLS Cup last year thanks in large part to the work of Drew Moor. New York have been the league’s best defensive side thanks to their aggressive move for Tim Parker. In Kallman, Omsberg, Miller, and Calvo, the Loons have four parts of a defensive corps to build around. Now what this unit needs most is a centerback in the mold of the players above. Someone who is not just an exceptional defender, but someone who makes the players around them better through their leadership. Add to the mix a fast attacking fullback, draft another solid centerback, and I’d consider that a successful offseason for the Loons. 2. Keep one ear to the ground in the goalkeeper market. 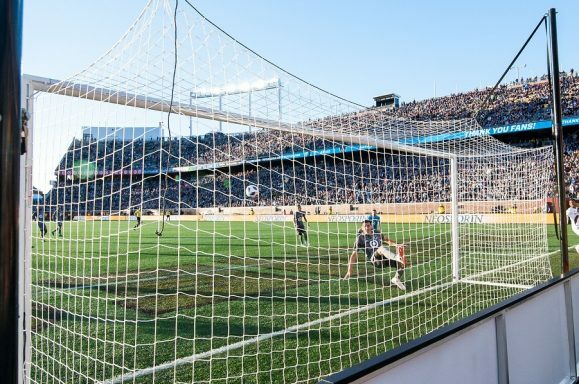 In the first few weeks of the season, the Loons relied on living saint Matt Lampson in net, while Bobby Shuttleworth overcame a weird illness. Once Shuttleworth returned, he proceeded to outright rob other teams for at least a month. Those vivid images have colored the view of fans on the team’s goalkeeping situation. The reality is that since midsummer, Shuttleworth has been poor. Where he once was near the top of American Soccer Analysis’ chart of goalkeepers’ goals allowed minus expected goals allowed, he ended the season in the middle, with a near-perfect score of -0.01 (in other words, he allowed almost exactly as many goals as you would expect given when shots were taken against him). Lampson also ended the year with some struggles, finishing with a final score of +1.48 (more goals allowed than expected). These numbers aren’t good enough, but for Minnesota, there are so many other deficiencies across the roster, that goalkeeper is nowhere near the highest priority. Still, if an opportunity arises, the team should consider it. There are a lot of unappreciated back-ups out in the league, like perennial “what if?” subject Zac McMath, the Union’s John McCarthy, bald guy Brad Knighton, and more. If an opportunity to add more competition to the goalkeeper position arises, take it! 1. Get better at speaking to the fans. Let’s put this down as a long term project, I hope it’s not too much to ask. Let folks understand a bit more about how the technical staff see the state of the team, and what their plan is. Stop treating the fans as idiots and gaslighting people. Get out in front of stories more by anticipating really obvious reactions. Announce player signings in interesting ways. Embrace the “all-access” style of the preseason videos that NYC and New York Red Bulls put out, and please for the love of god stop with the useless forty second clips of grass coming in and out of focus with terrible stock music.